ABOVE: Lübeck's Holstentor was built in the 1400s. Today, the fortified gate houses a city museum. 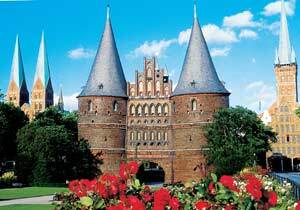 Lübeck was founded as "Liubice" (meaning "the lovely" or "the beautiful") around 1000 AD. The settlement didn't last long, but in 1143, Count Adolf II von Schauenberg recycled its name when he built a trading center in the city's current location. The town was destroyed by fire in 1157, and a disillusioned Adolf handed it over to Heinrich the Lion of Saxony, who began construction of a new city in 1159. Within a few years, Lübeck was the Baltic's answer to Venice, and the city's layout has remained essentially unchanged since the 12th Century. In 1226, Lübeck became a Free Imperial City that reported directly to the Emperor of the Holy Roman Empire. From the late 1200s until the late 1600s, Lübeck was the capital of the Hanseatic League, an organization of merchant city-states in the Baltic region. By the late 1600s, Lübeck was the third-largest city of the Holy Roman Empire, surpassed only by Cologne and Prague. The city remained free until 1806, when it was occupied by the French for several years and later joined the North German Confederation. "The target was Lübeck, a picturesque Baltic port relatively close to Kiel. There were some minor legitimate targets in Lübeck: there was a U-boat training school, and the docks unloaded Swedish iron ore. But the aiming point was not the school or the docks: it was the heart of the old town, with its densely packed, half-timbered medieval housing. On March 28/29, 400 tons of bombs were dropped on Lübeck, two-thirds of them incendiaries. The town was gutted more fiercely than any other German town to date, with well over 1,000 dead and injured and 16,000 left homeless. Of the 3,400 buildings damaged or destroyed, over 3,000 were residential, while 250 were industrial. The cost to Bomber Command was 12 aircraft of 234--a high but acceptable five per cent, given the raid's success." Reconstruction of the devastated neighborhoods began in 1949, with new buildings integrated into the Altstadt's 800-year-old street plan. Unfortunately, many of the new buildings were out of the character with their medieval predecessors, and buildings that historians and preservationists regard as eyesores continue to be built today. Still, history lies around every corner in Lübeck, and--unlike some historic towns--Lübeck is a living, working city and not just a Disneyfied open-air museum for tourists. Whether you're visiting Lübeck's great churches, touring historic public buildings and museums, or exploring half-hidden pedestrian passages with their tiny cottages and gardens, you'll enjoy your time in "the Hansa city of Lübeck." Photo: Lübeck Travemünde Tourismus / Thomas Radbruch.